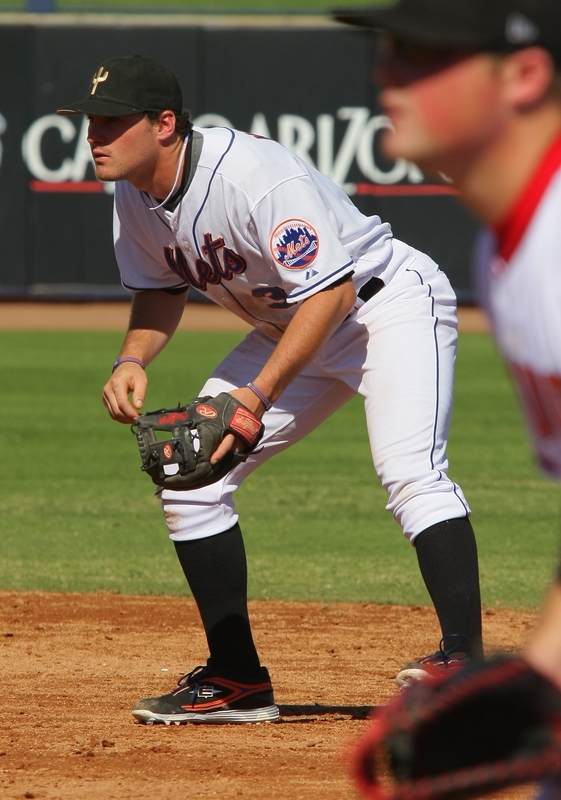 The experiences of Mets prospects while on the Arizona Fall League's Peoria Saguaros. Well as the AFL comes to close so does my season. As I look back on the AFL I can see that I learned alot and fixed things that I have needed to work on. I have met my goals here in learning to control my pitches better and throw more strikes. Now even though my stats don’t show it I feel really good about what I did down here and it will really help me when it comes to Sring Training next year. Now that it is all over back to Oregon I go and home to rest and relax and get ready for Spring Training. So hope all is well with everyone and see you in Spring training. Hey everyone back again. Sorry about last week but I was having some problems that i needed to take care of and forgot about the blog. But besides that we are still rolling along in the AFL. We are still wininng alot of games and battling for first place in our division. I have been pitching very well and making all my pitches work for me. Now I know the numbers are not shoiwing it but this is a league to work on things and get better so era and those things don’t matter that much at all. I am getting stronger and a better feel for my piitches as well which is nice. The rest of the mets on the team have been doing really good also. Murphy is still hitting the ball very well and getting alot better at 2nd base with his defense. Josh Thole is hitting alot better and still is doing a great job at catching. Bobby Parnell is still throwing the ball hard and getting people out, while working on things and getting better as a pitcher. Jason Vargas is also doing very well throwing all his pitches and keeping hitters off set and changing speeds, he gets stronger with every outting and looks great. Besides all of that things have been trucking along and the Arizona life has been alot of fun. I have been hiking around camelback mountain and working out at the gym as well and around this time Arizona is beautiful and the hiking has been alot of fun. Halloween here was a blasts it was a little weird cause I am from Portland, OR and it is never warm during halloween so it was a little change of scenerie for me around that time. playing with Peoria in the Arizona Fall League. I was very excited to begin my 2008 season in Binghamton and to be fortunate enough to finish the year in NY with the big league team. My experience this year was amazing the entire staff and players welcomed me and made me very comfortable in the midst of a pennant race. I look forward to hopefully spending the 2009 season in the brand new CitiField in Flushing and trying to help the mets win a championship. As of right now I am currently not in the lineup due a forearm injury that took place in the annual Rising Stars game. Hopefully I should be ready for action by the end of this week but as of now I am daily consulting with our trainer Joe Golia who has taken care of me since the injury. But I am looking forward to being back in the lineup and further hone my skills at second base and in the batters box. My experience in Fall League has been very enjoyable to this point and our team has great chemistry with a great deal of talent. Im eager to see how this season finishes with the makeup of our team and im looking forward to playing for a championship in Arizona. I have been playing second base since arriving in Arizona thanks to the help of our very talented staff including “Pop” Warner, Jack Voight, Rick Eckstein, and Wally Whitehurst I find myself more comfortable and second base daily. Everyday I am getting top of the line coaching and I feel that I am getting more consistent at second base and hope to one day be able to help the mets at that position if they so choose. Well thats enough about me. I am joined in the Fall League by some of the most talented players in the mets orgainzation which includes Tobi Stoner, Josh Thole, Bobby Parnell, Jason Vargas, Shawn Bowman and Eddie Kunz. Each one of the theses guys impresses me on a daily basis Jason has been dominate since his first outing. Bobby shows the plus fastball/slider combination that allowed him to help us down the stretch in the middle of a pennant race this year. Josh has been swinging the bat very well and has shown an ability to handle a pitching staff that is a little more experienced than he is, and I have heard on more than one occasion that the pitchers really enjoy throwing to him. Bowman now that he is healthy has been one of the most impressive players in the fall league on both offense and defense. And last but not least Eddie has thrown the ball very well showcasing the power sinker that should allow him to help the big league team in the very near future. Finally I would like to send out my thoughts and prayers to Leonard Davis and Shawn Bowman. Both teammates of mine and great people that need to be remebered in their time of need. Leonard unfortunately had a death in his extended family I believe and I would like him to know that he is in our thoughts. Also Shawn just left a few days ago to be with his father who unfortunately is very sick. I would like to thank everyone for reading this and hope that I was able to enlighten all you baseball fans to the ins and outs of the Arizona Fall League. I dont know if there is a question and answer to this thing but if there is I look forward to all of your questions. With another week down, our team is starting to look really good and we are putting things together. We are 10 and 5 and on a 2 game winning streak. I have pitched two more innings since then and had a ruff outing with 7 ground ball singles and had a little bit of a struggle from my defense behind me. But the next outting after that i got back right on track and pitched very well. Tomorrow I head to the Rising Stars game in Surprise to pitch at least one inning. The game should be alot of fun and a pretty big crowd as well! Thanks for all the comments and keep them coming! Ask any question and I will more than likely answer it in the next blog. On the question of Jason Vargas he is doing well and feeling even better his stuff is right back to where it was and pitching veery well! On the Mike Nickeas question he is good and played well in AA this year and is back at home relaxing! Life in Peoria is not bad at all there is westgate and alot things right around the field to do! I just got a new roommate, Ross Detwiler from the Washington Nationals, I have played with him before in the summer of 06 in the cape cod. Besides that nothing else new really new happening and there will be more next week!! bottom). Obviously, my name is Josh Thole and I am a catcher in the New York Mets minor league system. Currently, I have the opportunity to play in the Arizona Fall League for the Peoria Saguaros. I am 21 years old and was raised in a booming metropolis called Breese, Illinois. Actually, it is a really small town of about 3,000 people right in the middle of farm country. In 2005, I graduated from Mater Dei Catholic High School and was drafted in the 13th round of the 2005 draft by the New York Mets. As far as my years in pro-ball, each and every year has brought new experiences and helped me learn something that I consider valuable. 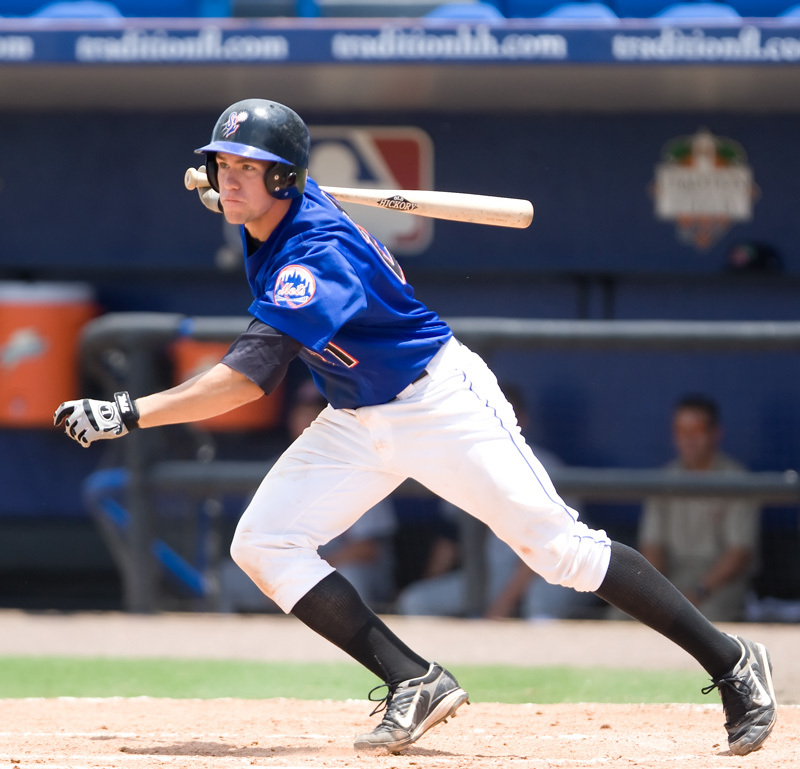 After being drafted by the Mets, I played my first pro-season in the Gulf Coast League. By far, my first year in pro-ball was the most challenging year both athletically and personally. I had never faced guys throwing at such high speeds while trying to hit with a wooden bat. Also, I was living on my own for the first time. In 2006, I played in Kingsport in the Appalacian League. During this season, I had to adjust to not being an everyday player, something I had never experienced before until then. In 2007, I played in Savannah in the South Atlantic League. In Savannah, I got the opportuinity to play everyday but I was playing primarily first base. In previous years, I had played a few games at first but the season in Savannah really helped me to understand the position. This past season I played in Port St. Lucie in the Florida State League. Here, I also got a another great opportunity to play everyday, However, I made the move from first base back to behind the plate. While having this great opportunity in the AFL, I have a few goals in mind that I hope to accomplish before the league ends. Before coming to the league, I knew that many of the top pitching prospects in minor league baseball would be in the AFL. I hope to adapt to the pitching and apply what I have learned to future seasons. As far as the catching part of it, this is a great opportunity to catch some of the best arms in minor league baseball. Also, I am getting a better feel on game-calling. Right now the Peoria Saguaros are 8-4. With the first week down and eight games played we are 7 and 1, rolling as a team veryy well! Now that we have some games under our belt and I see what our team can do, I feel very good with all the members of the team. We have some great hitters, besides the guys from the Mets (Murphy, Bowman, Thole) we got guys from Padres, like Huffman, Baxter, Kazmar, White Sox- Armstrong, Beckham and Gartrell, Cardinals- Wallace, Hill, Robinson, Greene, Nationals- Rhinehart and Desmond, just so many and they are all really god guys on and off the field! Pitching for us is just is good and working really well for us right now, making some big pitches in good places and holding teams to short amount of runs. I have pitched 4 innings so far and felt really great! All my pitches are working for me and I am doing alot better with my control as well. I have closed out all 4 games and got 2 saves out of 2 tries. Now with the question of what do I think of Murphy at 2B? I like him there he has great arm and reacts really well! I have confidence in him all the way. As do I in all my infielders and outfielders on my team, You have to have confidence in yourself and your teammates to be a good pitcher. Living in Arizona is also an amazing thing the weather here is the best ever. 85 and blue sky and sunny all the time is amazing and love playing in it as well. On the question of getting tickets its really easy to get, not alot of people show up to games but that can change if you come! Or if you can! Another week of exciting games and more next week when I will blog again. Thanks for the comments everyone and GO METS! Hi there, My name is Eddie Kunz and I am relief pitcher and its my first full year with the New York Mets. I am from Portland, Oregon and lived there all my life, born and raised. Went to Parkrose High School in Portland and went to Oregon State University for three years till I got drafted in 2007. Won 2 National Championships with Oregon State in 06, 07! After winning the second championship I went to short season in Brooklyn, NY to start of my Pro career and stayed there the rest of the summer. Now I am down in Arizona again for my second season in the Arizona Fall League. My first year was last year I was on the Scottsdale Scorpians, that was a great experiance for me and helped me move far in the Mets organization. Now back again I am on the Peoria Saguaros for year two. Last year I learned how to control my pitches and get my slider on track! Which worked and got me to start in AA this year and 2 weeks in the Big leagues in August. This year in the Fall Ball I am working on being more consistent with all my pitches and learning that the game is not in a hurry, I am a pitcher and I control the whole game. We started our season two days ago. I pitched in the 9th in the first game, felt really good and got 2 strikeouts and only gave up 1 hit. We won the game 9 to 3. Our second game was last night and we won that one to 10 to 7. Our team is very good and we have alot of good guys from all teams, (White Sox, Cardinals, Padres, Nationals and of course the Mets). More to come later next week. nymetsgrrl94 on The Last One! eligoodrich@aol.com on The End is coming Soon!